To move from cabinet member to President is of course a promotion. For mere mortals known by both their first and last names, promotions usually depend on how well they handled their prior jobs. Do the same rules apply to Hillary? If they do, has her performance as Secretary of State earned her a promotion? Hillary Clinton (the switchover to using both names signals that we’re about to get serious here) is a polarizing figure. To her admirers, especially those in the media and the entertainment industry, she is a rock star, a glittering symbol of what modern American womanhood can be. To her detractors, she is a doctrinaire ice queen, with all the ideological baggage of her husband but without her husband’s warmth and humanity. What does an objective assessment reveal? To begin, the record shows Hillary Clinton as one of the most intelligent and hardworking cabinet members in recent history. (There is no risk that her successor, John Kerry, will surpass her in either category.). As Secretary, she traveled nearly a million miles, visited 112 countries, and spent 401 days on the road. That amounts to more than a week per month away. She put those leviathan labors to good use promoting women’s issues, including establishing an at-large ambassadorship for that purpose. She helped transition Myanmar from military dictatorship to democracy, securing the release of political prisoner Aung San Suu Kyi in the process. But looking beyond her smarts, her drive, and her Burmese success, one sees little in her State Department tenure to justify star status. A modern Phileas Fogg, traveling around the world, would find little to suggest that America is better off or safer thanks to Clinton’s tenure as Secretary of State. After leaving Washington, the hypothetical jet-setter might head South to evaluate this hemisphere before crossing the ocean to check on the other. The biggest threat to American interests has been the radical leftism championed by Hugo Chavez of Venezuela. Chavez has established close military ties to Iran, has propped up Cuba’s communist regime to the tune of $5 billion annually, and has assisted terrorist groups like Hezbollah and Basque ETA. Even as Chavez’s health fails, his influence and prestige grows, extending to Argentina, Bolivia, Ecuador, El Salvador, and Nicaragua. Neither Clinton nor her administration has done anything to check his impact. American influence has declined to a particularly galling extent in Argentina, where President Kirchner just established a joint Argentine-Iranian task force to probe the 1994 bombing of the Jewish Community Center in Buenos Aires. As Israeli Deputy Foreign Minister Danny Ayalon noted, assigning Iran to the investigation, “is like inviting a murderer to investigate the killing he committed.” But the appointment is more than an affront to Israel. It is a reflection of American impotence in Latin America. Secretary of State Henry Kissinger, to illustrate the unimportance of South America to his foreign policy initiatives, once described Argentina “as a dagger pointed at the heart of Antarctica.” President Kirchner’s move is a thumb pointed at the eye of America. If our traveler crosses the Pacific, he will find still less ground for praising the past four years of American statecraft. In another thumb to the American eye, North Korea has just tested a third nuclear device. China has displayed more sanity but no less truculence toward our allies Japan and the Philippines. Russia has become more hostile than at any time since the Cold War, going so far as to bar American parents from adopting Russian orphans. Flying over the Asian subcontinent, our traveler finds only increasingly hostility – or apathy – toward the United States. Iran is doggedly proceeding down the path toward nuclear power status, unfazed by what it considers to be empty threats from the administration. Iraq is falling into the Iranian orbit, and follows that country’s lead more than our own. Pakistan harbors terrorists with impunity. Afghanistan is corrupt and falling apart. Each of these countries presents its own peculiar pathologies, and generalizations are dangerous. But they all exhibit one common trait: over the past four years, during the tenure of Hillary Clinton, their respect for and deference to the United States has diminished. Our traveler would find that the position of the United States in the Arab world in the wake of the Arab Spring has also worsened. We have seen in Egypt, and are likely about to see in Syria, that the departure of repressive autocrats presages the arrival of radicalized, anti- Western fanatics. Our foreign policy has been positively innovative in its capacity for failure. Somehow, we have figured out a way to fail to support the repressive status quo while at the same time failing to gain any credibility with the forces undermining that status quo. Visiting Northern Africa, the birthplace of the Arab Spring, our contemporary Phileas Fogg would see an example of where the United States has done worse than achieve irrelevance. In Libya, irrelevance would be an improvement. The full story behind the tragedy at Benghazi remains to be told, but what has emerged so far amounts to a State Department scandal. Though warned by our late ambassador of the dangers he was facing, the Department did nothing to secure his safety. When anti-American fighters carried out a well-planned assassination, Clinton’s Department supported the White House’s disinformation campaign, designed to deceive the American public into assuming that the violence was the result of an amateurish anti-Muslim video, rather than a carefully orchestrated terrorist assault. Our traveler would find the same strain of virulently fundamentalist Islam that fueled the growth of the Taliban and al Qaeda has now spread to North and Saharan Africa. We see it not only in Libya, but also in Algeria, where terrorists briefly captured an oil refinery and caused the deaths of over eighty Western workers; and in Mali, where fundamentalist forces have taken over half the country and bid fair to turn Mali into another Afghanistan. The United States has only one truly reliable ally in the region — which we have managed very effectively to antagonize. In September 2012, when Benjamin Netanyahu visited the United Nations to warn the world about the growing threat from Iran, the President found time to meet with David Letterman, Beyoncé, and Jay Z, but not with the Israeli Prime Minister. Secretary Clinton did not help the situation. The day before Netanyahu spoke, she announced that the United States would not set a deadline on talks with Iran – thus encouraging the Iranians to continue their game of pretending to negotiate while building new centrifuges. Hillary Clinton may have achieved rock star status in some quarters, but that gleam has not enhanced the image of the United States abroad. According to the most recent Pew Research Center Global Attitudes Project, taken in July 2012, confidence in the administration’s international policies has declined in every major international region in the past four years. Approval in mainly pro-American Europe was down 15 points from 78% to 63%. Approval in the largely anti-American Muslim countries declined from an already low 34% to an abysmal 15%. In Russian, the drop was 18 points, from 40% to 22%. And in China, the decline was an incredible 30 points, from 57% to 27%. These disappointing numbers are not entirely Clinton’s fault of course. There are strict limits to what a Secretary of State can achieve. She must operate within the constraints set by the White House. It was National Security Adviser Henry Kissinger, not Secretary of State William Rogers, who opened China, because Richard Nixon elected to pursue his China policy from the White House, not Foggy Bottom. She is also constrained by the accidental march of history. Secretary James Baker could build a grand coalition to confront Saddam Hussein because that dictator invaded Kuwait on Baker’s watch. Perhaps, given the chance, Hillary Clinton could have performed as well or better. But history did not so favor her. If Hillary decides to run for President in 2016, there may be sound reasons to support her. Her record as Secretary of State will not be one of them. Having a polarizing personality & memorable first name (that few in politics share) hardly qualifies a person for high office. Plus, Hillary’s age and health problems now pose added risks. During his last years in office, FDR suffered frequent hemorrhages of blood vessels in his brain causing episodic lapses of consciousness. (Google “FDR’s deadly secret”.) We can’t be sure of the degree of FDR’s cognitive impairment, but we can be sure Stalin took full advantage of the situation. Age & blood clots both add to the risk of dementia. Can America afford the added risk just to give Hillary the power & glory she’s always coveted? Plus, Hillary has embarrassingly little to show for her being “up in the air” sideshow, except for reward miles. Many of our Ambassadors got their appointments by making large contributions to Democrat candidates. So, flying endlessly around the world to sip tea & dine with potential contributors hardly seems commendable or important experience. 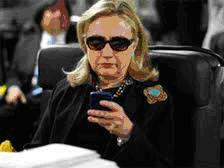 Hillary thought Richard Holbrooke would run State, & she would get all the credit & glory. But when Holbrooke died, she was left floundering in her own incompetence. Lacking any real experience (and ability? ), the job proved much too big for her. But it seems as though she entertained herself. After all, Bill was seldom around. Google “Hillary at the Cafe Havana in Cartagena” for one of those shows. Milton Friedman once said that “Policies and programs should be judged by their results, and not by their intentions.” Perhaps we should judge our Secretaries of State by the same standards. And judged by those standards, Hillary was an abject failure. Sure, we can blame all our international failures on Obama. But if a Secretary of State is supposed to be good at selling sound foreign policy to others in the world, shouldn’t she be good at selling the same to her boss? One can only hope that after eight years of Obama, the nation will be eager to throw the Democrats out of the White House, not elect another one, even one with so called “star power” like “Hillary.” If the GOP finally gets its act together, and nominates, e.g., a Gov. Chris Christie-Sen. Marco Rubio ticket for 2016, I highly doubt that Hillary or any other Democrat will win the White House. No one in their right mind would want another four to eight years of their failed domestic and foreign policies.